There’s something wonderfully beguiling about Moroccan food. It has that tinge of the exotic with an Arabian nights, camels and belly dancers kind of feeling, but the ingredients are usually easily accessible and approachable. You don’t find things like dried fish flakes or chicken feet in Moroccan cooking (not that there’s anything wrong with these — they just usually necessitate an extra shopping trip.) It’s all the stuff of childhood food — cinnamon, carrots, pastry — used in new and surprising ways. While I love me my couscous, merguez, tagine and harissa, my favorite Moroccan dish is bastilla (also B’steeya, pastilla, and any number of other arcane spellings). It’s a meat pie (originally made with pigeon, but you usually find a chicken version in the US) in a pastry crust sweetened with cinnamon and sugar. 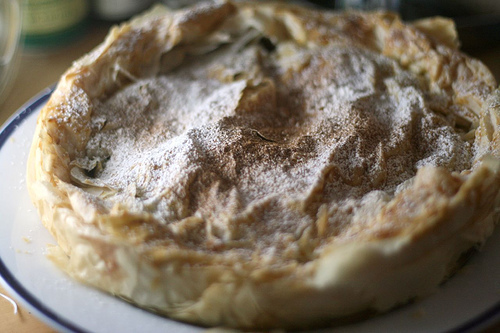 I first encountered Bastilla in Anthony Bourdain’s A Cook’s Tour (a great beach book if you’ve never read it) and I was so intrigued by his mouthwatering description that I set out to make my own bastilla that week. At the time, I lived in a studio apartment in Manhattan with a stainless steel corner instead of a proper kitchen, and the bastilla recipe I found (from Claudia Roden’s wonderfully authentic book, The New Book of Middle Eastern Food , which I had enthusiastically checked out from the New York Public Library) was so time consuming and complicated (though ultimately delicious) that I swore off making it ever again, and confined my bastilla eating to restaurants. The only marginally difficult part is working with phyllo, which I buy frozen and is available at many grocery stores nowadays thanks to the popularity of those little Greek spinach triangles. 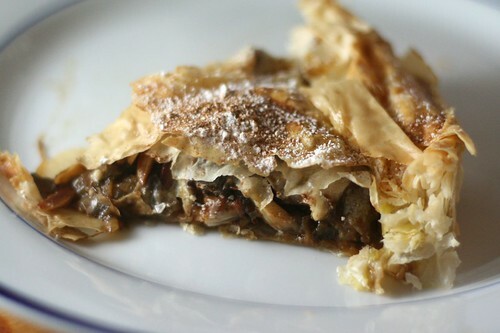 Phyllo can be quit nervewracking, due to its extreme thinness and tendency to break. However, the secret to phyllo is that it’s really quite forgiving: if it breaks, just put in another layer with some overlap. It’s not fiddly, and so long as you brush each layer with some melted butter to keep them separated it ends up baking up like a crisp and delicious dream. And it looks wonderfully gothic while you’re working with it — I kept thinking of Miss Havisham and furniture covered with dustcloths. Apart from the phyllo, this comes together relatively quickly, and is quite impressive. If you don’t like the combination of sweet and savory, you can skip the dusting of cinnamon and sugar over the finished pie, but you’ll miss out on that authentic Moroccan exotic touch. This is guaranteed to take you right to Casablanca, and as a bonus it takes less time to make it than it does to actually fly to Casablanca. Saute onions in a large saucepan with the oil and cook over medium low heat until translucent and just beginning to color. Meanwhile, toast the almonds until golden brown and chop coarsely. When the onions are cooked, stir in the ginger and cinnamon, then add the chicken, and season with salt and pepper. Turn the heat up to medium, and cook,uncovered, stirring occasionally, until the onions are a pale golden brown, about 15-20 minutes. The liquid should be entirely absorbed. Add the cilantro and the almonds and mix well. 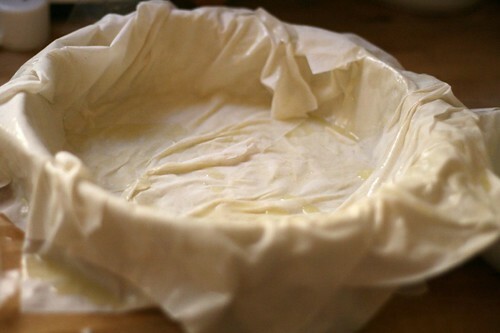 Brush some of the melted butter into a 9 inch cake pan, and lay in the first sheet of phyllo (if it tears, just overlap the two pieces slightly along the seam.) Brush the phyllo with more butter, and lay another sheet on top with the overhang rotated about 90 degrees. 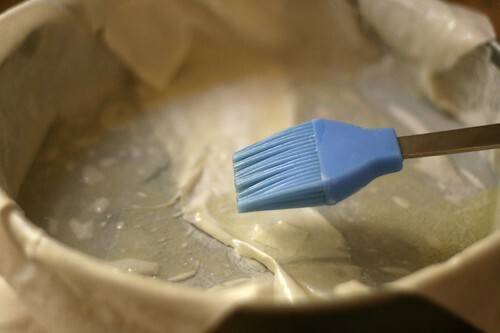 Repeat, brushing each layer with butter, until you have 5 layers. Spread the chicken mixture into the center of the pan, then bring up the phyllo overhang. Lay the remaing two sheets of phyllo on the top, separating them with another brush of melted butter, and fold the phyllo into a crust at the top. Brush the top of the pie with the egg yolk mixed with a drop of water, and bake the pie in the oven for 40-50 minutes until puffed up, crisp and golden. Sift the powdered sugar and cinnamon over the top and serve hot. Oh my gosh, I LOVE these! My husband and I call them Meat Donuts, which might not sound so good, but Ohmygoshtheyaredelicious. Seriously. Am tempted to run out door, straight to market for ingredients. Thank you! I agree about Moroccan food. I love how comforting and warm and simple it is. I have Arabesque, too, but I never have tried this recipe. Sounds so delicious. I also love the photos of the cooking process. Yum! 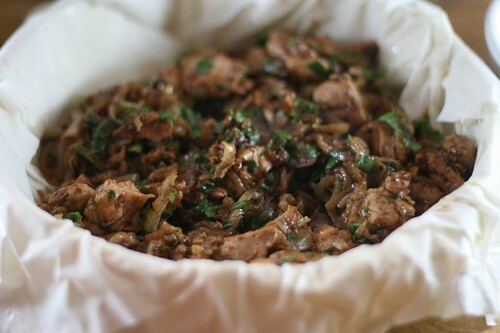 This is my fave Moroccan dish too! Thank you for sharing the recipe. I hope to make it before summer’s over. This sounds divine. I might stash the recipe and make it in the early fall. Sounds like a perfect sunday night dinner when there is just a hint of a chill in the air. Thanks for posting! Is there any way of making vegetarian bastilla? Felizitas — While I haven’t tried it myself, I expect that the filling could be replaced with a vegetarian fillings — I’d try sauteed mushrooms and onions with similar spices. If you do try it, let me know how it turns out. Kate, thanks for your comment. We just had it at our favorite Restaurant in St. Paul, fi;lled with spinach and feta cheese- same spices. It was delicious. I’ll try the mushrooms though. Restaurant is calle The Barbary Fig. I made this, and it was delicious! My boyfriend and roommate both loved it, as did I. Will be making again, very soon! Thanks.